Ask the City of Charlottesville to Divest from Weapons and Fossil Fuels - World Beyond War . . .
Jump down to read resolution and sign the petition. We are asking the City of Charlottesville, Va. to divest all public money from weapons companies, major war profiteers, and fossil fuel companies. Sponsored by: Charlottesville Center for Peace and Justice, World BEYOND War. Also endorsed by: Indivisible Charlottesville, Casa Alma Catholic Worker, RootsAction, Code Pink, Charlottesville Coalition For Gun Violence Prevention, John Cruickshank of the Sierra Club, Michael Payne (candidate for City Council), Charlottesville Amnesty International, Dave Norris (former Charlottesville Mayor), Lloyd Snook (candidate for City Council), Sunrise Charlottesville, Together Cville, Sena Magill (candidate for City Council), Paul Long (candidate for City Council). Read the case for divestment in the Daily Progress. Read responses to possible objections. See signature count on our petition. Beginning April 16, 2019, sign up to speak at the May 6 City Council meeting. You may or may not win the luck of the draw and receive a 3-minute speaking slot. If not, show up well before 6 p.m. for the 6:30 meeting, to be first in line for additional speaking slots. 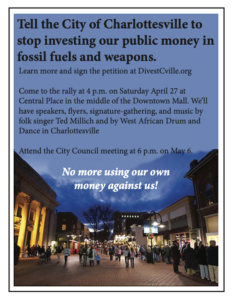 Rally for divestment on Saturday, April 27, 2019, at 4 p.m. at Central Place in the middle of the Downtown Mall in Charlottesville, Va. Music by folk singer Ted Millich and by West African Drum and Dance in Charlottesville. Event. Facebook event. Attend the Monday, May 6, 2019, City Council meeting. We have been told that there will be a presentation and discussion on this issue, but not yet a vote. We will demand a vote. Event. Facebook event. We’re gathering signatures on this website and offline, including at tables at local events. To volunteer for tabling or to get a supply of petition forms, contact david [at] davidswanson [dot] org. Or print and make your own copies of the form. Print out signs that say DIVEST. Here’s a color flyer / advertisement. Also in black and white. Here are smaller two-to-a-page black and white flyers that can be printed on brightly colored paper. Make your own or get a supply from david [at] davidswanson [dot] org. Spread the word on Twitter and Facebook and everywhere you can. BE IT FURTHER RESOLVED, that this Resolution shall be binding City policy and shall be in full force and effect after adoption by the City Council. 8. Examples include U.S. wars in Syria, Iraq, Libya, the Iran-Iraq war, the Mexican drug war, World War II, and many others.